“And thus, Lord Vittore, giant amidst the exalted company of heroes, bestrode the mountain and there did he ensnare his foe. Vittore’s long dark locks blew about a glorious face befitting a god, such was its beauty. The gold-trimmed, pure white cloak of kings swirled about his back. Proud and piercing were his eyes, yet still could they display pity for his enemy. Such was his grace and modesty. Beneath his triumphant heel, the fires of the vanquished city burned. Smoke spiralled into the sky from which dark clouds had been banished at the fall of the iniquitous citadel. The souls of the damned were taken to eternal night where the stars dare not penetrate. “The felling of Orgaskcz the Bloodchild was the one ordained task that remained and evil would be cast down. So it was written. So it was that good would triumph and the songs would record the celebrated passing into living legend of another hero born to the eternal service of the Kingdom of Goedterre. “The long hours of battle had not dimmed Vittore’s strength. He took his gauntleted fists from his hips and, with the sun glinting from metal that evil blood dare not stain, he drew mighty Tagliente and held the blessed blade two-handed before his face. “On his knees and beaten, Orgaskcz awaited his destruction. Dark was the blood that stained his armour. Crushed it was at one shoulder, revealing the writhing veins beneath his skin. His foul face, curved fangs chipped in his mouth, red eyes dim with defeat and heavy brow split to the bone, was bowed towards Vittore. 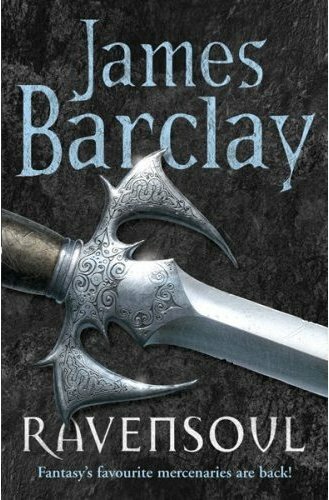 “Krisja, the black axe, was swift in Bloodchild’s hands. The blade carved through blessed armour, spell-forged mail shirt and deep, deep into pure flesh. Bloodchild’s sneering laugh froze the very air. Lord Vittore lifted a hand from Tagliente and wagged a finger at Bloodchild. ‘Now wait just a minute,’ he said and collapsed to the bare rock of the mountainside, his torso divided neatly in twain. He saw Orgaskcz climb to his feet over the body of the fallen hero. He saw Vittore’s blood sluicing over the cold grey of the mountain. He saw visceral fluid dripping from Bloodchild’s axe. And he saw the broken fanged grin. He checked the words he had written to ensure they were not leading him astray. They were not. ‘Ah — ‘ said Grincheux, swiftly assessing his position to be beyond the reach of parlous. Orgaskcz’s single eye swivelled to focus on him. His huge stooped body followed it, thick neck allowing no independent head movement. He flicked his axe one-handed, casually. Vittore’s body parts were plucked from the mountain to tumble down the stark black fire-pitted cliffs. Evil roars of triumph rose from the depths of the burning city. Grincheux tried to look invisible, sitting on his rock and cursing the fate that brought him to this end. So quickly, the observance and recording of certain victory had become the witnessing of inevitable defeat and despair. The penning of an epitaph. It was not a situation with which he was at all familiar. In fact, no scribe of a great hero had ever been in this position. He studied his parchment intimately, praying to be overlooked. ‘Scribe have no hero,’ managed Orgaskcz, his voice booming from the cliffs and his chuckle setting loose chippings to tumble away out of sight. Grincheux’s heart thundered in his chest. He could hear the great mound of Orgaskcz approaching. Each footstep thumped vibrations up his back. The axe was dragging behind the dark master. Sparks jumped and flew. Traditionally, scribes were untouchable. Faithful recorders of exploit and adventure. But the rule had never been tested. After all, good always triumphed over evil. Always. Grincheux felt compelled to look up through his quivering eyebrows and into Bloodchild’s black orb. Triumph and satisfaction mixed quite without attendant malice. He watched the wounds on Bloodchild’s face knit and heal and his body swell with new strength. The skin beneath his bone armour shone a deep slate grey. A line of drool spilled from his mouth and sizzled on the bedrock. Bloodchild advanced more quickly. Grincheux’s heart attempted escape even though the rest of his body refused point-blank to move. Perhaps he would not get a chance to formalise the epitaph. Perhaps that would be a task for another. What he had seen was already logged in his book in the Vault of Deeds, far away in the Academy of Goedterre. Now there was a place it would be good to be warming one’s tootsies right now. It would be a cruel fate indeed if he were not alive long enough to formalise his initial thoughts into searing tragic prose. Frankly, he didn’t think any other scribe would have the wit to interpret his visions. With every stride and every word, the drool spat out, scarring the face of the mountain. Bloodchild’s arms pumped the air. Hoots and howls grew in power. To the right, a volcano erupted, gorging itself on the land below. The last blue of the sky was consumed by lowering black clouds. Thunder rattled the heavens. Lightning speared down, splitting rocks asunder. Grincheux could not help but be impressed by the number and delivery of these pillars of evil stereotyping. The drama masters back at the H.E.R.O. Academy could learn a thing or two from this. Bloodchild was behind Grincheux now. While he wrote, the scribe could feel the hot, sour breath washing over his head. At any moment, he expected the burning of acid drool down his back. Grincheux felt a huge hand close on his right shoulder, his neck and right up to his lower jaw. He whimpered, wishing for the end. Orgaskcz’s head came level with his, the eye reading his jumbled, spidery script. So different from the flowing beauty of the page before. ‘Urrr… ‘ apologised Grincheux, barely able to hold his quill. Grincheux did the only decent thing. He passed out cold. The student’s face fell and he dropped his parchment on to his desk. Every other eye of every other student was upon him, utterly relieved not to be him. At the end of the dusty, lantern-lit classroom, the tutor pushed a hand through what remained of his white hair and favoured the whole class with a frown that hid his eyes. He pointed behind him at the chalk board. It was adorned with beautifully sculptured letters and words arranged into melodious, powerful sentences. Reluctantly, Bluntnib picked up his parchment again. Around him, his fellow students offered him no support whatever and to a girl and boy, tried to appear disapproving. There was a snigger from somewhere too. And another. And a snort. The tutor let the silence grow, daring any child to snicker. The tutor cleared his throat. ‘He bestrode the mound of the tower, his every mighty stride shattering the earth beneath his feet. His ascension inevitable and glorious. None could stand before him and live. With one deific blow, he smote the great portals of the tower to splinters and crushed the shards to dust. Before him, rose Gargantua. Her eyes were flame, her breath poison, her tail spiked and deadly. And in each of her dozen limbs, a weapon dripping evil did threaten his blessed body. ‘Long they fought and desperate was the struggle. Gargantua, powerful and filled with hate and loathing for the forces of good. But He was greater. His every strike suffused with righteousness and driven by purity. He was cut by many blades yet he was not daunted. Feint heart ne’er won the day. One by one, the limbs of evil were severed to lie writhing upon the cracked, black stone of the tower. And when Gargantua stood beaten before him, he prayed and gave thanks for the God that protected him. Now, did he strike evil down. A single magnificent blow. Gargantua’s head tumbled from her body, there to rot in the filth of her defeat. Silence gripped the classroom. Wide-eyed students sat quivering before the tutor. Mouths hung slack. Some even had tears on their cheeks. In the corridors, the bells were rung. In the classroom, books were slapped shut and students began to rise and babble. ‘Study Horatius, chapters three and four. Write me a hundred words on the defeat of Xindok by Friday!’ shouted the tutor above the hubbub. Principal Kettifer smiled and turned from the classroom window. He walked the short distance to his office through the swarms of students of every discipline choking his path. He closed his door behind him and drank in the serenity. His gaze travelled the shelves crammed with parchments and the walls cluttered with certificates and signed paintings of the greatest heroes ever to pass through his fingers. He frowned. Something was out of place. He looked down at the uncomfortable, splintering wooden chairs in front of his desk. One was occupied by a scowling, bitter individual. Kettifer’s shoulders slumped. He cleared his throat irritably and marched to his own chair, feeling the soft leather embrace him as he sat. ‘Do you ever make an appointment before interfering?’ he asked. ‘I do not need an appointment,’ said the individual, voice hissing like a lizard’s. Kettifer rubbed at his forehead, feeling the weight of his advanced years. Across the desk sat your archetypal dwarf. Heavy brow creased in a perpetual frown; stocky and powerful frame clothed in gold-inlaid wool; ceremonial axe leant against the chair; legs not quite reaching the ground. That sort of thing. Archetypal in all respects barring his alopecia. Twas from whence his bitterness blossomed. He was Garn Gletterforst, deputy chair of Goedterre’s Ministry of Heroic Endeavour. ‘You have had this chair raised,’ said Gletterforst. ‘The best Hero school in Fairhaven, nay the whole of Goedterre. Everyone knows that,’ said Kettifer feeling a nag of anxiety. Gletterforst raised his eyebrows. Well, Kettifer thought he had. Hard to tell, in all honesty. Gletterforst pointed at the school’s induction plaque that sat proudly in the centre of the wall behind Kettifer’s head. Gletterforst looked set to swallow his own fist so hard did he ram it into his mouth to quell the rage that lay within. Kettifer watched him turn a fascinating shade of red before returning to something approaching the colour of a dwarf more likely to survive the day. He began counting off on his fingers. ‘Hesperion the Swift, outpaced and beheaded by Zaldek Onegear. Jason Hammerfist beaten by Orlec the Puny in an arm wrestling contest in which our man’s limb was torn clear of its socket. Hector the Colossus brought down by a slingshot to the forehead. That’s one of our patented methods of killing. That was the trouble with civil servants. No imagination. Everything was always to do with stationery. Gletterforst cleared his throat noisily and snatched up the papers. Kettifer sat back to watch his reaction. It wasn’t long in coming. The dwarf straightened in his chair and peered at the cover sheet hard. He scanned the rest with increasing rapidity before going through the whole lot a second time in greater detail. A smile oozed across his face. It looked rather out of place but the eyes he turned on Kettifer sparkled with pleasure. An unholy bellow reverberated from the depths of the school followed by a thud that shook plaster dust from the walls of the office. A demonic stench, brief but powerful, permeated the room. Gletterforst regarded him for a moment. The floorboards shuddered to the beat of heavy footsteps. A large dark shape thundered past, heading for the catacombs. Shouts and hurried, multiple lighter footfalls came on behind.